The post Dog Snorting — Why It Happens and What to Do About It by Jennifer Lesser appeared first on Dogster. Copying over entire articles infringes on copyright laws. You may not be aware of it, but all of these articles were assigned, contracted and paid for, so they aren’t considered public domain. However, we appreciate that you like the article and would love it if you continued sharing just the first paragraph of an article, then linking out to the rest of the piece on Dogster.com. Our four-legged friends are adorable, but sometimes the sounds they make are anything but. Dogs of all ages, lifestyles and breeds make snorting sounds from time to time, but if you find yourself wondering, “Why is my dog snorting?” often or if dog snorting is unusual for your pooch, here are a few factors that could be at play — and what you should do about dog snorting! Dog Snorting — What Causes It? What causes dog snorting? Photography ©BiMKA | Thinkstock. For some pet parents, those dog snorting sounds are just a part of life. If you happen to share your home with a Pug, Pekingese, Shih Tzu, Bulldog or another brachycephalic breed (think any dog with a “pushed-in face”), your dog will likely snort from time to time because of his flat, wide skull shape. “Brachycephalic pets have a higher risk of respiratory illness, given that they have smaller openings to their nasal passages, narrower tracheas that can collapse, and long, soft palates,” explains Dr. Kathryn Boyle, DVM, Banfield Pet Hospital. “These attributes are part of why brachycephalic breeds tend to snore and snort more than other breeds.” She notes that the nasal issues often associated with these dogs can also put your pet at an increased risk of overheating, pneumonia and severe respiratory distress. What If You Notice Your Dog Snorting Suddenly? If your pet has suddenly starting snorting, or is not a brachycephalic breed, Dr. Heather N. Mitchell, DVM, Animal Health Clinic in North Dakota, warns that both dog snoring and dog snorting can be early signs that there’s something blocking your pet’s nasal passages, such as an infection, inhaled plant material or a mass. “If the snoring or snorting continues for a while, it definitely warrants a check over with a veterinarian,” she advises. Can You Prevent Dog Snorting? If your Bulldog has always made snorting sounds, there’s probably not much you can do about it … unless the snorting becomes frequent and more severe. “If, despite an owner’s best efforts, a brachycephalic dog is having more difficulty breathing on more frequent occasions or with decreasing amounts of stress … a veterinarian will fully examine and assess the pet to determine if surgery could be warranted or bring some relief to the effort of breathing,” Dr. Houchen notes. Surgical options for dog snorting would include opening the narrowed nasal passages, removing the laryngeal pouches and shortening the soft palate. 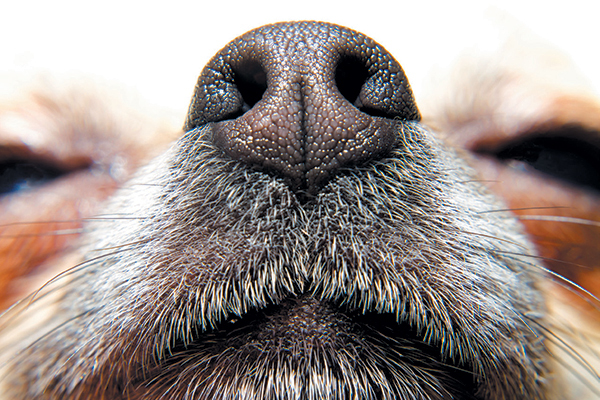 Pet owners should also remain aware of doing anything that might make dog snorting worse. Dr. Boyle advises using harnesses instead of collars when walking to prevent putting additional pressure on a dog’s neck. “We also recommend keeping these dogs in more controlled temperatures and environments, such as in the air conditioning on warmer days,” she says. Dr. Houchen notes that helping your pet maintain a healthy weight can also help lessen any dog snorting, as obesity tends to worsen these symptoms. In some cases, determining any outside factors that may cause dog snorting is the only prevention. “Being aware of what your dog is sniffing can sometimes help … but as every dog owner knows, sometimes that’s not possible,” Dr. Mitchell says. If your dog’s snorting has gotten severe or is caused by a more serious issue, such as a foreign body, you may need to treat it. Whether the dog snorting is caused by chronic rhinitis, a nasal or sinus mass, an anatomic abnormality or bleeding, Dr. Houchen notes that your veterinarian will conduct a workup with the goal of assessing clotting status or determining the presence of bacterial or viral infections, sedating and examining of the nasal passages and upper airway, assessing nasal secretions for the presence of bacteria, fungi, or parasites, taking x-rays of the skull or performing a rhinoscopy. Depending on what your veterinarian finds, she may recommend medications such as antibiotics or anti-inflammatories, or surgery to remove polyps or masses. “The prognosis is highly dependent on what is found during that workup — finding a small, benign polyp that will eliminate a respiratory situation upon removal will warrant a good prognosis, while discovering a highly invasive cancerous mass carries a poorer prognosis,” Dr. Houchen concludes. Thumbnail: Photography © 19msa05 | iStock / Getty Images Plus.